Those residing in the area of Rustburg, Virginia that are searching for valid nurse aide training can find them on the list shown here. These programs have been authorized by the Board of Nursing and will allow you to be qualified to take the examination for your certification. Working as a nursing assistant in Virginia can be very fulfilling, not to mention rewarding. The demand for nursing assistant in the state is currently increasing every year. This increase is believed to continue up until the end of the decade. So if you’re planning to start a career in this field, then it’s better if you begin right away. Nursing assistants are entry-level professionals. Compared to other careers such as nursing, you don’t have to spend years training to become one. All you need to work as a nursing assistant is to get the proper training and take the state’s certification exam. One of the most common ways of getting the necessary training is to enroll in a state-approved course. There are dozens of programs that are offered almost anywhere in the state. There are even some training institutions that offer multiple classes, which can make things easier for those who have busy schedules. 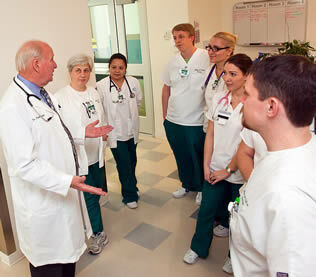 CNA training in the state consists of at least 75 hours of supervised clinical practice and classroom lectures. Students are placed under the care of a qualified registered nurse who completed a course about training nursing assistant students. Most of the training programs that are offered in the state can be completed within 2 to 6 months of continuous training. You’ll be allowed to apply for the certification exam as soon as you complete your training. You can get the application forms by following this link: http://www.asisvcs.com/publications/pdf/075301.pdf. Nursing students and graduates are allowed to immediately apply for the certification exam, even if they didn’t complete a program. The certification exam is conducted by the NACES with the assistance of Pearson VUE. It is a two part exam that consists of a written/oral test and a random skills evaluation. Candidates are required to pass both tests to get a certification. If a candidate fails, he can reapply and retake the tests as many times as needed within 2 years after taking it for the first time. Getting this certification will open up a lot of opportunities. Not only will you be allowed to work as a certified nursing assistant in a state-approved training program, but you will also be allowed to enroll in an advanced CNA program. If you receive advance training, you’ll also get the advance certification that comes along with it. This new certification will allow you to perform new tasks as well as increase your chances of a promotion or a raise in salary. If you want to find other health care career opportunities in Virginia, then you can visit www.dhp.virginia.gov. You’ll also find instructions and Candidate Handbooks about different professions. This is a census-designated place that is in Campbell County. The place was named after Jeremiah Rust, who donated a large amount of land back in 1784. It is also the county seat of Campbell. Rustburg is included in the Lynchburg Metropolitan Statistical Area. According to the census of 2010, their total population had reached up to 1,431 people. It has a total area of about 10.8 sq miles and has a population density of 132.5/sq mile.